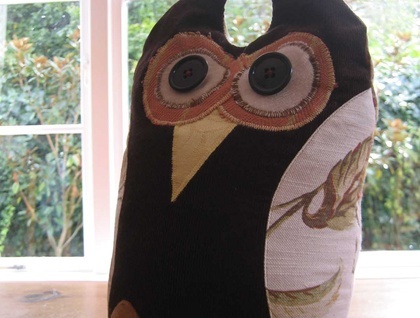 Extra tall tawny Morepork Doorstop as requested. Front panel - Chocolate Brown Cord fabric, wings and back are Laura ashley hydrangea floral upholstery linen fabric. natural coloured background with green leaves and gold tonal hydrangea flowers. Extra big eyes with vintage buttons.